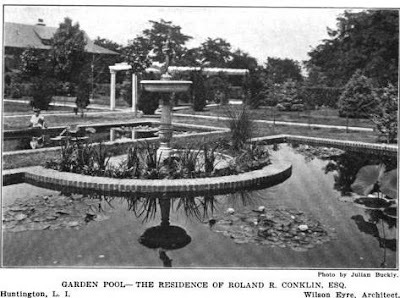 'Rosemary Farm', the Roland Ray Conklin estate designed by Wilson Eyre c. 1907 in Lloyd Harbor with Olmsted landscaping. 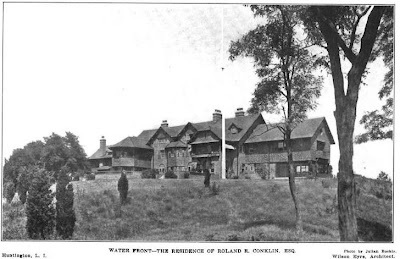 Conklin was a descendant of John Conklin who settled in Huntington c. 1640. 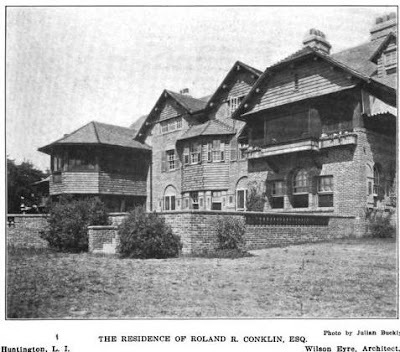 Born in Illinois, Conklin operated one of the largest realty firms in Kansas City, Kansas and moved the business to New York in 1893. The business became the North American Trust Company and was appointed the fiscal agent of the United States Government in Cuba. At the turn of the century Conklin helped to develop Cuba being heavily involved in banking, telephone operations, sugar and railroad companies. He also founded and developed Roland Park in Baltimore and Euclid Park in Cleveland. He was a proponent of the motor bus and owned what his obituary in the New York Times called a "motor land yacht". They go on to say "the pictures of the vehicle suggest a Fifth Avenue bus of the next to last model with a roof garden on top. But the homelike equipment of the bus equaled all but the most luxurious of today's trailers." During the Summer of 1915 Conklin, his wife and a handful of friends took this 'motor land yacht' from Huntington to the Panama-Pacific Exposition (Click HERE and HERE for pictures of the Conklins and the bus). 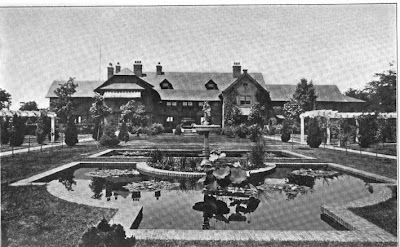 In 1917 Conklin held the National Red Cross Pageant on his grounds. Click HERE and HERE for info and pictures on the event. 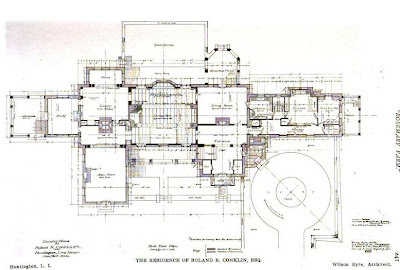 In 1930 the estate was sold to the Seminary of the Immaculate Conception and remains in their hands. 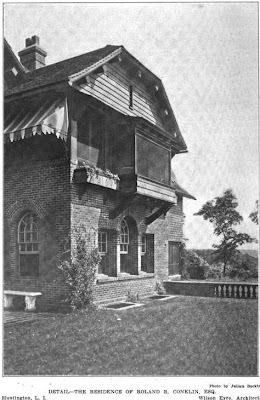 The house was destroyed by fire in 1990. Click HERE to see what's left of 'Rosemary Farm' on google earth. Click below to see 'Rosemary Farm' intact in a 1953 aerial shot. 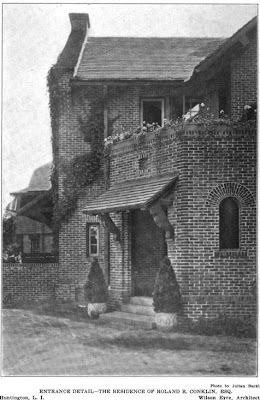 Pictures from Architectural Record, 1910. Impressive. How big was the property? It was over 400 acres. 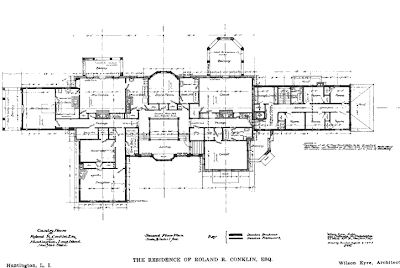 Wilson Ayre was a very prolific Philadelphia architect, and unfortunately much of his work in the city was destroyed. I'm so sad to see that this house is gone too. whoa - the first winnebago - they must have been some tired by the time they got there because if you'll notice, trucks of that time did not have tires with air in them. they were solid rubber - not exactly a boulevard ride. question - was the seminary occupying the house when it burned or was it another li relic? this is one of the most amazing houses yet. it includes almost every architectural add-on imaginable and they really got into awnings - they're built right into the house. the brick and shingle combination - nice. and the overhanging porches and balconies and sunporches. it just goes on and on. i love this place and the interiors are spectacular. that wall with the organ in it is great and the one in the entrance hall. is that all carved wood or is that a tapestry? i love the living hall and the library. all primo. at least if it was demolished some of that woodwork might have been saved. so sad it burned. the good ones go and we're - sigh - left with the colonials. The seminary built their own large building on the property and I think they used the house for meetings and the like. Am an architect student in Denmark doing my final thesis on the estate. 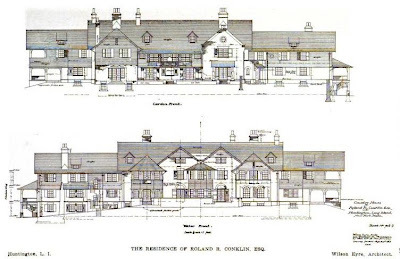 Does anyone out there have som more information or pictures of the Rosmary estate? In the 1960s I explored this estate. The mansion described was, I was told by a seminarian, used by the nuns who administered to the seminary. 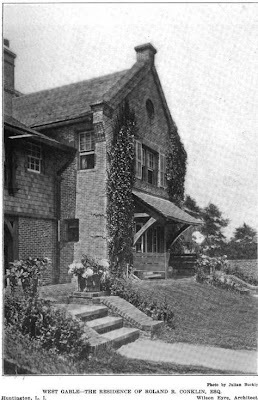 However, beyond this mansion and past the stables at the far northwest corner of the pasture area was another large house, which at that time was abandoned and derelict. Noticing on Google Earth I see no structures left in that area. Any info on that mansion? I know it existed as I was inside, while the orignal mansion was still intact and being used as the convent. I'm a descendant of the Conklin family. He would've been my great, great,uncle. I have the original journal of his trip in his Motor coach. It was an interesting trip. It reads like a book. Very interesting family. Hi Sherrie I remember going to this property years ago...it was beautiful is it still open to the public?